Crowds turning out to see the cherry blossoms in D.C. shouldn't have any added complications on Metro. Visitors to Nats Park, however, need to be mindful about shorter service hours when games go late. UPDATED Friday April 6, 9:30 a.m.: Metro added additional track work, reflected below. WASHINGTON — There is no scheduled daytime Metro track work this weekend as the cherry blossoms in D.C. hit peak bloom, but Nationals fans should be sure to check the rail system’s hours. After regular weekend service during the day and Saturday with no track work, the Blue and Yellow Lines are scheduled to single-track after 8 p.m. Saturday night. The Red, Orange and Silver lines are scheduled to single-track after 10 p.m.both Saturday and Sunday. The Silver Line is scheduled to be cut back to run only between Wiehle-Reston East and Ballston. On Sunday night only, the Green Line is scheduled to single-track after 10 p.m. 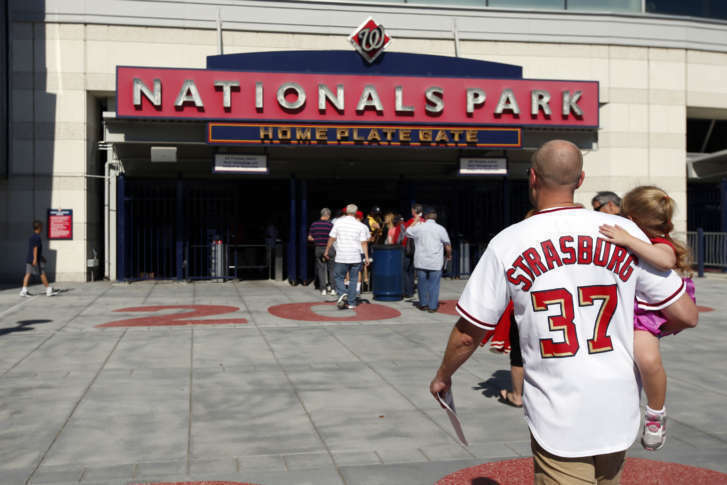 The Washington Nationals host the Mets at 8:08 p.m. Sunday, but Metro now closes at 11 p.m. Sunday nights. The final train north toward Greenbelt and any transfers to other lines is scheduled to leave Navy Yard-Ballpark at 10:52 p.m. on Sundays. The last train south to Branch Avenue departs at 11:18 p.m. According to Baseball Reference, the average length of a game through the first week of the season is 3 hours, 9 minutes. The average length of a nine-inning game has been 2 hours 59 minutes. On weeknights, fans could run into similar issues now that the rail system closes at 11:30 p.m. Monday through Thursday, but probably only for games that start later than usual, have rain delays or go into extra innings. On Friday and Saturday nights, there should be fewer issues, because Metro closes at 1 a.m. The last trains Friday and Saturday leave for Greenbelt at 12:52 a.m. and for Branch Avenue at 1:18 a.m. Drivers who park at Metro can consider going to Branch Avenue instead of other stations to have the best chance of being able to stay for the entire game.